My thoughts this week revolved around almond paste and Bradley Cooper. Anyway, no sooner had I resolved to eat the almond paste by the hunk when a craving for a saltier version of a classic chocolate chip cookie convinced me that those two really ought to meet. My steadfast (if a bit green) pastry assistant--who declared that the dough looked, smelled, and sounded so good that she wanted to plow her face into it--settled for prepayment in the form of a bite of almond paste and two chocolate chips. I imagine such things might win Bradley's affections too. With an electric mixer, or the paddle attachment of a stand mixer, beat the butter and sugars until fluffy and homogenous. Eagerly consume a .5-ounce bite of raw almond paste as you break the remaining 3-ounces into small pieces. Add them to the creamed butter and sugar, blending until well-combined. Next, add the eggs and extracts, beating until incorporated. Combine the flour, baking soda, and salt in a separate bowl. Pretend that you sifted the flour. Add these dry ingredients to the wet ingredients in three easy installments, mixing until just combined. Remove two chocolate chips from a 12-ounce package as a minimum wage for your assistant and fold the rest in by hand (well, with a spatula). Plop medium-sized ice cream scoopfuls onto parchment- or silpat-lined baking sheets. If your refrigerator's cooperative, set the cookie sheets inside to firm up for five minutes before baking to minimize spreading. Bake for 11 minutes, or until it looks like the cookies have just returned from Saint-Tropez. 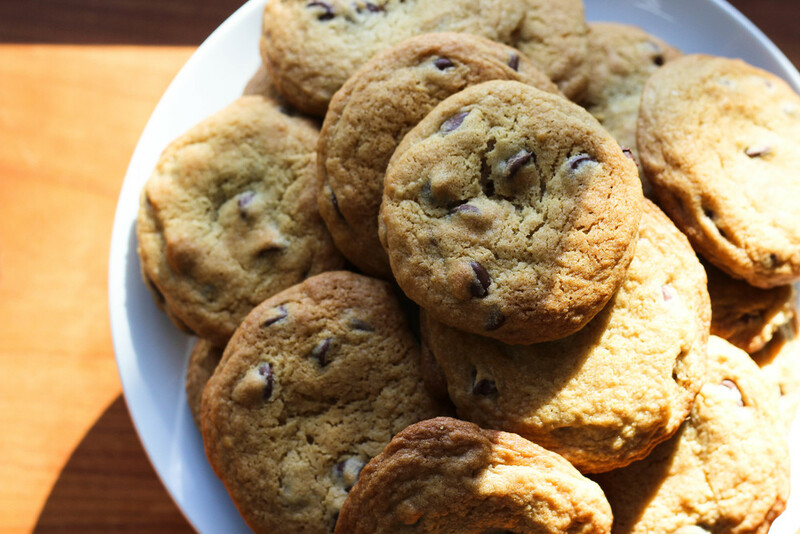 Let them cool on the baking sheet for 5 minutes before transferring to a wire rack, or into your pockets.